Record the sights, smells, tastes and sounds of winter! This winter writing prompt challenges your child to practise sensory description. Juggle this trio of gingerbread men right onto a table top. Where your child's crayons can make their frosting colorful and pop! The Snowflake Fairy is creating a magical shower of friendship flakes! Celebrate the chilly winter months by coloring this enchanted scene. Here's an igloo coloring page for your kids to use this winter. When the weather starts to get chilly, wouldn't you want to wear a warm winter hat? 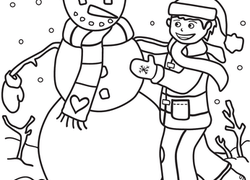 Get ready for those cold days with this coloring page! Get in the holiday spirit by finding all of the 27 merry snowmen as they frolic around in this winter wonderland. It's a winter wonderland in this snowy scene, featuring a boy building a friendly snowman. Is your child struggling with multiplication? Try the lattice method! This is a great visual tool for kids to do double digit multiplication. Create a design for your very own snow globe, with a fun souvenir activity. Little artists can pay tribute to their hometowns as they draw in the globe. Host the Winter Olympics on your dining room table with this fun holiday ski racing game. Walking in a winter wonderland! Get ready for a frosty winter, and create a season-appropriate wardrobe for your own paper doll girl. This Poinsettia plant coloring page will allow you to celebrate the colors of the season with this beautiful holiday plant! Cozy up with your child and this winter-themed version of tic-tac-toe.